Si Sosyland, est le pays des 1001sosies, c’est aussi celui des 1001 surprises…dont l’une d’elle est de vous présenter, avec un grand plaisir, une exquise sosie anglaise : Lissa Statham sosie d’Angelina Jolie, que j’ai connu…par le sosie de Brad Pitt…. Voici donc son interview en V.o. et vous assure que la traduction viendra tout prochainement. Which circumstances made you enter the world of doubles? Quelles sont les circonstances qui ont déclenchées ton entrée dans le monde des sosies ? 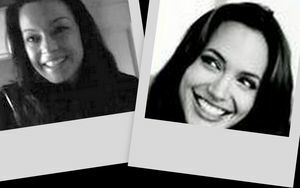 For years people kept saying I looked like Angelina Jolie so one day I finally sent my photo to an agency to see what they thought never actually expecting a reply and within 24 hours I had my first job for a photo shoot with a top magazine, and have never looked back. How long have you been living in the world of doubles? Depuis quand vis-tu dans le monde des sosies ? For about three years now. How did you work on your character? Which contacts have been necessary, did you make any researches, what type? Tell us! Comment as-tu travaillé ton personnage ? Quels ont été les contacts nécessaires à prendre, les recherches à faire…expliques-nous ? I have contacted agents over the years and they have me and I am also on casting lists and model agencies which all help to promote my work. I have a tattoo that jolie has because I liked it and believed in its meaning but it helps with the look now too. I don’t research as much as some look alikes do I just check when I go on a job what she is wearing and how her hair is etc just to be right on the day. I have watched clips of her on tv just to see how she poses and presents herself as every detail there helps to get the look. Are you a perfectionist in the part you play as a double? Es-tu perfectionniste dans ton rôle de sosie ? Im not sure if perfectionist is the word for it, I like to be the best I can and I do wear what she would wear and make my hair styles to how she would present it or each occassion. Have you had to have an agent? Is he / she your husband/wife or mate? Which relationship do you have? A-t- il été nécessaire que tu ais un agent ? Est-ce ton conjoint ? Quelles sont vos relations ? I do have several agents in the uk and france. We are not related and have never met face to face just via phone calls and emails but after years of working together you do get to know them and I would say some of my agents I have made great friends with too, its nice when you can work like this together and create a professional yet friendly atmosphere. What would your agent say about you? Que peux dire ton agent de toi ? I would hope they would think I am a nice friendly easy to work with person I guess only they can answer that one though. Although when I have been on jobs I have always had good feed back and they have been pleased with my professional attitude. Has being a double, changed anything in your everyday life? What do your relatives, family and colleagues think of that? Est-ce que cela a modifié ton quotidien ? Qu’en penses tes intimes, amis, famille et collègues ? I wouldn’t say changed my everyday life, it has helped me meet some wonderful people and make some amazing new friends , I have seen places I would not of seen and had some great fun, although it can be hard work too lots of travel and living out of suitcases now and then, but it’s a great change from the usual day job. My friends and family have been brilliant about it and really encouraged me to go for it and been proud of me. I have had some amazing support from my best mate who has also been on certain jobs with me to support me and travel with me when its been long drives. I have had no end of support from look a likes I have worked with and made some amazing long life friends through them, some of whom I call best friends now too. Do you live at work and in town as a double? Vis-tu au boulot ou dans ta ville en sosie ? Pourquoi ? Not sure what you mean about this question??? But if its what I think.. I work as my double and play the part until the job is over then im lissa again. I work in different towns and country’s and had the pleasure recently to work in my own town which has never come up before as derby is a rather small quite town compared to others such as London etc. How do live and feel when you’re performing as a double? Comment vis-tu quand tu es en représentation de ton personnage ? I sometimes get nervous just before a job but only because I want to do my best and get the results the clients are after. Once im actually in my character I go for it enjoy it and love to be part of the whole people entertaining industry. What good memories do you have with your fans? Quelles sont les bons souvenirs avec tes fans ? I have lots some people are so lovely and supportive. I remember working for a promotion for a photographer and we went out in a limo that night with my own body guards and photographer we put on the whole pretend fame show and the public we met that night were amazing, the company made posters of me and little cards of me so I could sign my autograph … I remember saying no one will want my autograph……. and that night a signed hundreds. Once you get great response to work you do they become great fond memories as its good to have good feed back and know you are doing your work right. Has your opinion about the original you’re the double of changed since you’ve been representing him/her? Ton regard a-t-il changé à l’égard de l’original, depuis que tu le représentes ? No I never really had an opinion of angelina jolie, or any other celebrity really. They are like you and me still human and living their life even if they are famous. I have got to know her more since I first started I guess and I like the person she is, she sticks by her beliefs and gets on with life. A very independent woman like myself. Have you had the opportunity of meeting your hero, on which occasion? Are you still in touch? As-tu eu l’occasion de rencontrer ton héros ? Comment cela s’est-il passé ? Gardes-tu des contacts ? No never met her and probably never will, although the world is a small place so you never know I guess. Have you noticed any similarities in your lives? What do you think? As-tu décelé des ressemblances dans vos vies respectives entre l’original que tu représentes et toi-même ? Qu’en penses-tu ? Yes I have we dress the same like the same colour and style clothes. 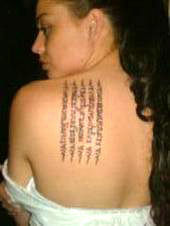 We both like tattoos she has 13 ish apparently I have nine, all of which are to do with our beliefs and protection. We are both independent woman and care for the country we live in and people we live with. We are both mums. Work hard and play hard. Have you ever fooled people with your resemblance? Come on, tell us! However I have never said yes I am . Have you got a little secret you would like to share with us? A secret hobby? As-tu un petit secret, que tu pourrais aimablement nous délivrer, une passion secrète ? What is your opinion about your career as a double ? Quel regard portes-tu sur ta carrière de sosie ? I think it’s a great chance to do this kind of work and a pleasure to be the character I am in my work. I think as long as you believe in who you really are and keep your feet on the ground this kind of job will work for you. I believe you get out of life what you put in and why not go for it and do something that is out of the ordinary. Life is for living after all. Its great that you get chance to see how the other half live and its just entertainment after all, it hurts no one to play a part and I’m thankful that I get the chance to do this, after all it wont last forever so for as long as it does I will make the most of it. So far the furthest I have been is Cannes, which may I add…… and has been my favourite place to be J I have been asked to go to places much further but not felt ready to do this right now. Have you had the opportunity of meeting stars? What exchanges did you have with them? As-tu côtoyé des stars ? Quels sont les échanges que vous avez eu ? I have, not mega stars but stars all the same and they have been great. The ones I have met have supported the look a like work and some have even asked for photos with me rather than me asking them J which is great. They have complimented me on my work and asked questions about it with real interest. Have you ever been on TV shows? How did it go on? Es-tu allé sur des plateaux télés ? Comment cela s’est-il passé ? No I havent although I have been asked although I was already on other work at the time and couldn’t make their shows. However I have been on a sky channel where they showed pictures and spoke about my look alike work when I was in a top magazine …. I missed the show too friends told me about it J I have been on radio though where I did an interview for a local radio station which was a great experience and fun. Have you performed in films? What are your impressions? As-tu tourné dans des films ? Quelles sont tes impressions ? Do you work with other doubles? Travailles-tu avec d’autres sosies ? Yes I do many different characters, some who would work and live around jolie and some you would never put the two together J I have a uk brad look alike who I work with and I have worked with a French one too who has become a great friend of mine and was a pleasure working with, , who was brought into the look alike work in a last minute situation and who made a great, great job and is now part of the look alike work. Without his input that day in cannes we would have been stuck for a brad and he makes a great one! Do you make tours? How do you get organised? Do you make tours with other doubles? Fais-tu des tournées ? Comment t’organises-tu ? C’est avec d’autres sosies ? There are often not tours but jobs where I work with lots of look alikes for different occasions we either meet at the job or if a long drive or flight we travel together. Depending on how close you live to others. I live quite along way from most look alikes so it all depends on the area of the job. Often they do parties and promotions where look alikes in the uk get together or if we do charity events. What advice would you give to someone landing on « Sosyland » ? Quels conseils donnerais-tu à quelqu’un qui atterrit à Sosyland ? I would say go for it and enjoy, it can be hard work sometimes but its all worth it. You don’t often get the chance to live like a star J Do your re search get the right outfits and play the part. Find a good agent and work with them always better I think to work with an agent than alone ,as then you are safer in all manner of ways, they work hard for you to and do actually care about their look a likes. Create a good portfolio and get some good pictures on line to promote yourself. Take on board the good public feed back, but neve forget who you are and what you as a person stand for. What is your opinion about « Sosyland » ? Quel regard tu portes à l’égard de Sosyland ? I think for me it is a great part time work, I have my full time day job too and would not want to personally do look alike work full time, but it does work for some . It is a great opportunity and fun. It can also be a testing time to your patients as not everyone agrees or believes In the look alike industry but we are all entitled to our opinion I guess. It is a great chance to see parts of the world outside your comfort zone and to meet some amazing people. It is harmless as long as you play the character right and never over step boundaries where your character would choose not to go. Is there anything you would particularly like to say ? As-tu quelque chose que tu souhaiterais dire particulièrement…. I have enjoyed this interview very much J thank you and it is a pleasure to be part of your work. I would just like to say that because someone is a look like doesn’t mean they are trying to be something they are not, it doesn’t mean they have lost touch with who they are or the real world they just like to play a part entertain the people and have fun. A lot of hard work goes in to a gig too its not all fun. When is your next performance ? As-tu une prestation prochaine à nous transmettre ? I am doing some charity work in the next few weeks where I am having a pretend wedding its kind of a comedy twist a couple you never thought that would marry… jolie and Austin powers J my dear friend we work together a lot and I think it will be a great fun job. As-tu réalisé quelque chose d’artistique comme un disque, un film… ? I thank you very much and wish you all the best in Sosyland ! Je te remercie et te souhaites tous mes voeux à Sosyland !